Earlier this week Bruin fans were happy, and it was written: Blame it on Three-O. Now some consternation is creeping in. Let it be written: Blame it on Brehaut. Richard Brehaut (which rhymes with “Three-O”) was supposed to be the #2 QB for UCLA this season, backing up Kevin Prince. But when Prince went down with a broken jaw, it wasn’t Brehaut who came to the rescue. Instead, Norm Chow went with Kevin Craft as his starter. Craft played the whole game against KSU Saturday night, and sucked slightly less than he did last year, thanks to the much-improved line play in front of him. But Craft also showed why Bruin fans are lusting for Prince’s quick return. KSU was able to push the Bruins to the limit, because the UCLA Offense couldn’t keep any momentum going. And KSU was a lousy team, playing on the road. A week from Saturday, the Bruins will be out of their Rose Bowl comfort zone, playing against a Stanford team that is vastly superior to Kansas State… and Kevin Craft will be at the helm again. Which brings us to Richard Brehaut. Coach Neuheisel says that Brehaut has been having great practices, and that he wants to get him some playing time. Apparently, Norm Chow wants to stick with Craft. It sure would be nice if Chow could explain to unhappy Bruin fans what the problem is. What is #2 QB Brehaut doing wrong that puts him BEHIND #3 QB Craft? Unfortunately, Chow can’t publicly divulge Brehaut’s weaknesses, because that might give the opposition an unfair advantage, should Craft get hurt (or yanked). All that is certain is that Brehaut has an upside that Craft can’t even dream of, and that fact should be foremost in the Coaches’ decision-making process. Hopefully, if Craft falters in Palo Alto, Chow won’t be afraid to pull the plug on Craft, and go to the Freshman. Luckily, this will be an issue for only one more game, as Prince is recovering quickly, and it is anticipated that he will be ready for the upcoming Oregon game. By the way, while most Bruin fans realize that Craft (like War) is Not the Answer, there are still a few holdouts. In fact, the two biggest (non-trojan) a-hole/idiots on the Bruin Zone message board are Craft’s biggest proponents… which of course proves that Prince and/or Brehaut will NEED to come through, if the Bruins want to turn in a season that all Bruin fans can be proud of. And speaking of which… There is NOTHING in the World that can engender more Pride than the students of the UCLA Spirit Squad, and here are a few, right now. Pride goeth before a Fall? Nope, Fall started yesterday. 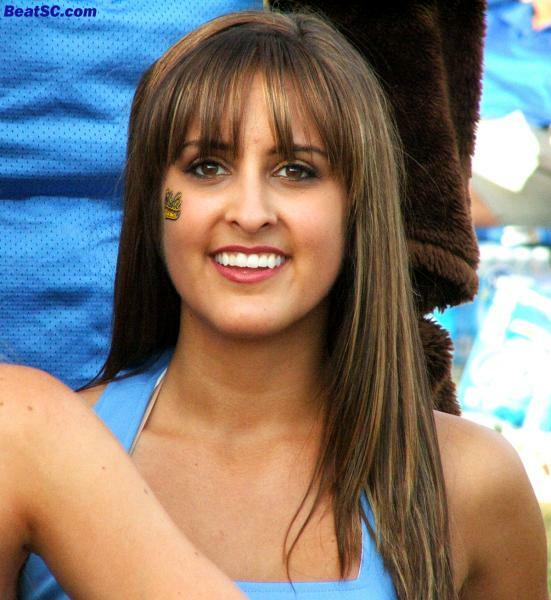 "ONE DAY MY PRINCE WILL COME" was published on September 23rd, 2009 and is listed in Blue & Gold News, News from the Dark Side, UCLA/usc/Cheerleader Photos. With your disapproval of Chow’s choices, would you refer to him as Prince Valium? Just wondering if anyone else got a e-mail from Brianna sayng she would send them a autographed photo or something?I’m just asking,because I drew the lovely Brianna some months ago,and sent it to her and a e-mail came sometime later saying that she would send me something “special” but nothing ever arrived. I know there was a time when Brianna was going through “something” and I was wondering if she just forgot(which I understand) Hope she is alright.